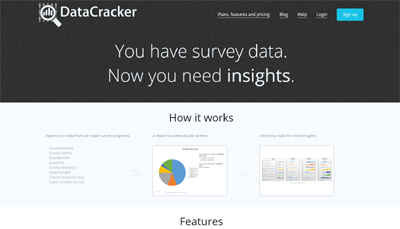 DataCracker is a new web-based survey analysis tool that makes it easy for anyone to find and share insights from their surveys. It fills the gap between overly basic data analysis options and advanced analysis options such as SPSS and Wincross. It is for the non-researcher, the everyday people who are now surveying more than ever. DataCracker equips users with powerful statistical testing and advanced data analysis features such as WordCloud, Segmentation and Predictive Modelling. The tool has a familiar Office-like interface and works in web browsers using HTML5 technology, so it’s easy for anyone to jump in and get work done on the go.